Yes. For webhooks in an error state, Mandrill provides the raw webhook request content and sample code so you can emulate the failed POST using cURL. To view webhook batch details, follow these steps. Go to the Webhooks page in your Mandrill account. Click on the number shown under Number of events. Click the view batch button. 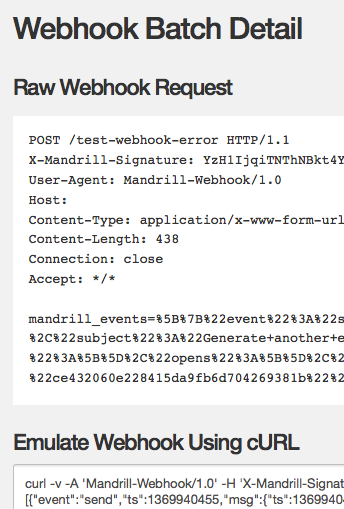 At the top of the page, you'll see the raw webhook request generated and sent by Mandrill. At the bottom of the page we've provided a cURL command you can use to mimic the webhook POST in your own environment. If the webhook payload is too large to fit on the common command-line, we'll provide a link to download it in full as a .txt file. You'll need to save the file in the working directory before you run the cURL command.